Summer is quickly approaching, and the forecasts are predicting another season of record-setting heat. 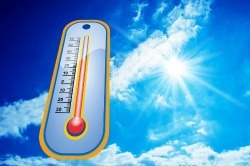 With the scorching heat comes higher-than-usual monthly energy bills, but don’t despair: You can make a difference on your home’s energy usage this summer. When the sunlight comes beaming in through the windows, it can drastically heat up your home. This causes the air conditioning unit to work much harder to keep up with the warm air temperature. To prevent this, draw the blinds during the hottest parts of the day to prevent the home from overheating. Once the sun has gone down, you can open the blinds and even open the windows to cool the house down without blasting the air conditioning while everyone is asleep. In an attempt to keep the sun – and the heat it brings – out of the home during the summer months, you may end up relying on indoor lighting more than you do in other seasons. According to the U.S. Department of Energy, lighting makes up about 10 percent of your home electricity costs, and you can save up to 80 percent of that by replacing your traditional incandescent bulbs with light emitting diodes (LEDs). People tend to be hesitant when considering purchasing LED bulbs because of their expense, but LED bulb prices have dropped in price by 85 percent in recent years. Even when your electronics are powered off, they can continue to use energy and drain power. We don’t mean to spook you, but it’s the truth. This is known as vampire energy, and it has been haunting households in the United States for many years. According to the Department of Energy, vampire loads are responsible for roughly five percent of the energy consumed in the United States, costing customers more than $3 billion a year. But it’s easy to make a difference. The simplest solution to this common dilemma is to plug all electronics in each room into a single power strip. This way you can flip the power strip off when the appliances are not in use. If you want to know more, some electric companies, like Duke Energy in North Carolina, offer Energy Vampire Calculators that help you determine how much money you can save by unplugging certain appliances. Duke’s calculator also sheds light on certain products that are considered energy vampires, such as chargers, cable boxes, printers and more. Turning up the air conditioning after a long day outside may feel great now, but it won’t feel as great when you notice how much your utility bills have skyrocketed. Heating, air conditioning and ventilation systems account for nearly half of all household energy consumption, according to the Department of Energy. Installing a smart (or programmable) thermostat that operates with a schedule can keep your home a consistent temperature throughout the summer. Many of these thermostats also include the technology to control your thermostat from a laptop, tablet or mobile device. Programming the thermostat to the family’s summertime schedule can save energy so that you don’t forget to turn it on and off when necessary. Smart thermostats also make it easier to participate in your electric utility's “conservation events” or “peak hours” – essentially times of exceptionally high electricity demand, usually during summer afternoons – which could result in credits added to your bill at the end of the month. Even with a smart thermostat, it’s important that your A/C unit is in good shape and running properly. Annual maintenance can ensure efficiency and improve the comfort of your home, so what better time than summer when you use it the most. According to the Department of Energy, the quickest way to save energy on home cooling is to regularly clean and replace your cooling unit’s filters. You can lower your air conditioner’s energy consumption by 5-15 percent by replacing a dirty, clogged air filter. Since Americans spend roughly $11 billion each year on air conditioning, this can add up to substantial savings. See how it easy it is to make a difference in your home’s energy usage? Don’t sacrifice staying cool this summer to save a few bucks. Use these five tips to relax, stay cool, save money and enjoy your summer. To learn more about how you can be a smart power consumer, check out our fact sheet here and our series of YouTube videos here.